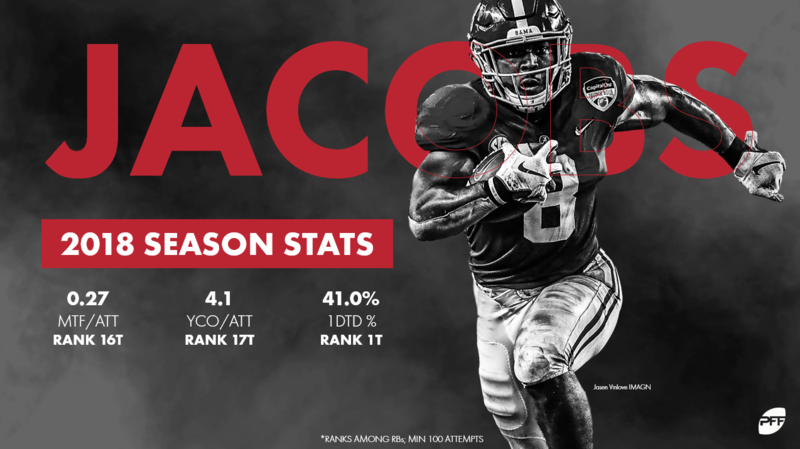 Josh Jacobs has the perfect skillset that teams need in today’s NFL as he stands tall as our No. 1 running back prospect for the 2019 NFL Draft. Running backs who can make an impact in the passing game are more valuable than those who excel as pure runners. In fact, last season in the NFL, the top five running backs in our PFF WAR (Wins Above Replacement) were Christian McCaffrey, Alvin Kamara, Saquon Barkley, Tarik Cohen and James White. All five produced PFF receiving grades of 84.0 or higher, and all five also pulled in at least 70 receptions. The trouble with running back value is that there is a low correlation (0.36) from year-to-year in WAR, however, their value in a given season is maximized when they can make an impact in the passing game. There are two ways that people look at Jacobs’ numbers at Alabama. Jacobs saw 121 carries in 2019, a mark that ranks 58th among draft-eligible running backs. This wasn’t through injury, it was because the Alabama backfield was the most talented in the nation. Four running backs for the Crimson Tide saw more than 60 carries, and all four of them produced PFF rushing grades of 76.7 or higher. Two running backs saw more than 20 targets and both of them, Jacobs and Damien Harris, produced PFF receiving grades of 70.3 or higher. The reason why the Alabama backfield was split the way it was in 2018 is likely because of how many good players they had at the position. With that in mind, it’s important to look at how well Jacobs performed when he was utilized and that’s when it starts to become clear why he will be one of the top running backs, if not the top running back, off the board this year. My colleague Mike Renner tweeted a fantastic number earlier this week about Jacobs: 41% of Jacobs rushing attempts in 2018 resulted in a first down, the highest percentage of any running back in college football. Not just this draft class, but in all of college football. Jacobs forced 33 missed tackles on 121 carries, averaging a missed tackle forced once every 3.7 rushing attempts. That ranks seventh in this draft class among running backs with at least 100 carries. He also ranks seventh in the class with a PFF elusive rating of 109.8 and with an average of 4.07 yards after contact per carry. However, it’s his work and skillset in the passing game which really makes him appealing to teams in the NFL. Jacobs saw just 56 targets in his three seasons at Alabama but that doesn’t tell the whole story. When he was used in the passing game, he was dynamic, averaging 12.4 yards per catch and forcing 21 missed tackles from 48 receptions. He was also consistent with just three drops over that span. Those missed tackle numbers showcase just how difficult he can be to bring down in the open field, something which Jacobs has put on display since he first saw the field for Alabama back in 2016. One play that stands out at this time was this play against Mississippi State. On 1st & 10 with 10:21 left in the second quarter, he catches the pass from quarterback Jalen Hurts in the flat and begins to take it upfield. He effortlessly made the defenders miss with just two quick cuts. He showcased that ability again on a 33-yard touchdown against Auburn in the Iron Bowl in 2018, this time making the reception downfield. Once the ball was in his hands though, he was just as tough to bring down as he was when he caught the ball in the flat. After shrugging off two tacklers, he cuts by another and is in the end zone. Jacobs didn’t have a great day at his Pro Day and that, combined with any concerns about his usage at Alabama gives pause to the notion that he should be a first-round draft pick in many eyes. Though, we were never going to suggest him as a first-round draft pick though, our thought process being that the value just isn’t there for a running back. When running backs start to come off the board though, Jacobs’ film, skillset and PFF grades suggest that he should be the first to hear his name called.